To increase the input range of your Handyscope HS6 DIFF when performing differential measurements, the new Differential attenuator TP-DA25 is introduced. The Differential attenuator TP-DA25 is a differential 1:25 attenuator, combined with a low noise differential measure lead. It is specially designed to be used with the Handyscope HS6 DIFF, to measure high voltages up to 1000 V CAT II. 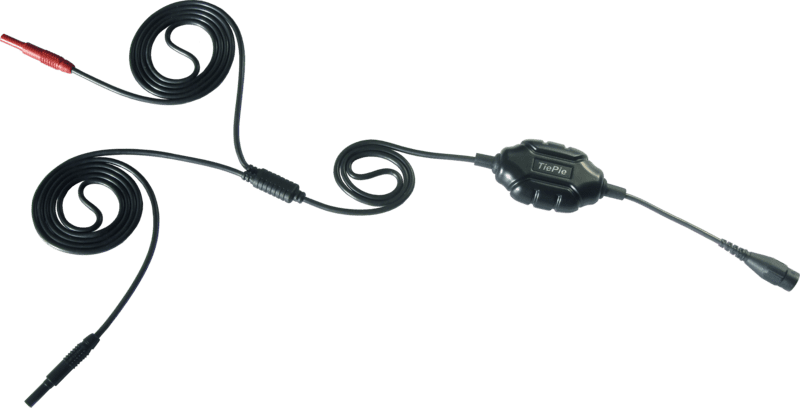 Due to the differential inputs of the Handyscope HS6 DIFF, a standard attenuator or attenuating oscilloscope probe cannot be used without introducing measuring errors. Instead a differential attenuator is required. The Differential attenuator TP-DA25 can simply be placed directly on the input of the Handyscope HS6 DIFF and the test probes directly on the 4 mm banana plugs at the end of the measure lead. The Differential attenuator TP-DA25 has a passive design and does not require a battery. The specially designed Differential attenuator TP-DA25 has a high Common Mode Rejection Ratio (CMRR), it is very insensitive to external interfering signals. The two ends with the banana plugs can be placed up to more than two meters apart, while picking up very little interference. With a conventional oscilloscope with a standard oscilloscope probe this is not possible. The maximum distance between the positive side and ground is then usually limited to approximately 20 cm. And this 20 cm is very susceptible to interference. The Differential attenuator TP-DA25 for the Handyscope HS6 DIFF does not have this disadvantage. External interference is very well suppressed by the special construction of the Differential attenuator TP-DA25. Measuring between two distant points is now possible. For more information, including detailed specifications, go to the Differential attenuator TP-DA25 pages.